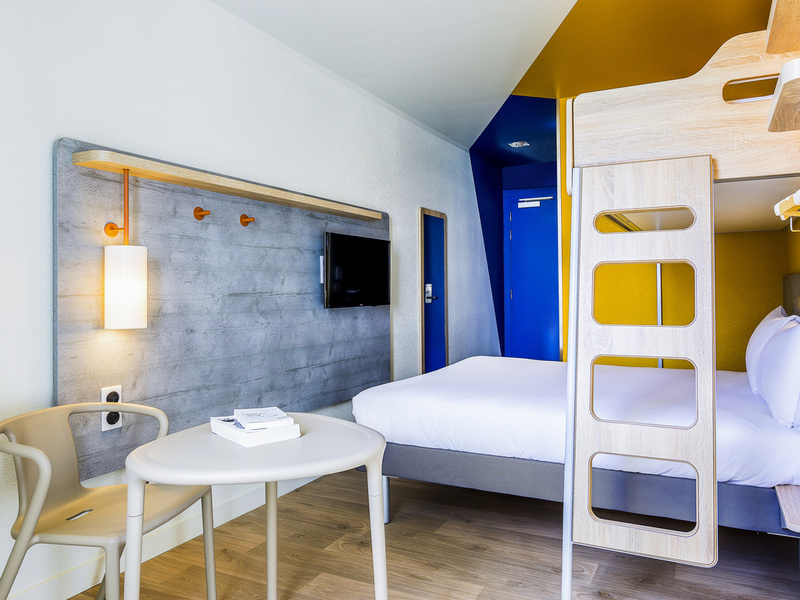 The ibis budget Paris Gennevilliers hotel, with 133 rooms, will open in January 2018. Located in the Hauts-de-Seine department, the hotel has an enclosed car park and allows access to central Paris and the whole western half of the Île-de-France region (S tade de France, Roissy, La Défense, etc.) in less than 20 minutes. Discover our new 2017 design ibis budget rooms for 1, 2 or 3 people. By car, the ibis budget Paris Gennevilliers is located at the exit of the junction between the A15 and A86 highways. An enclosed car park with CCTV is available. By public transport, the RER C Gennevilliers station is a 10-minute walk away. For 1, 2 or 3 people, enjoy the very latest Nest concept of ibis budget rooms. Room equipped with the comfort of a cozy duvet, shower and toilet. Enjoy the flat-screen TV, multimedia connections and WIFI. A new Nest-design room with double bed and cozy duvet, spacious shower and toilet. Take advantage of the flat-screen TV, multimedia connections and WIFI.